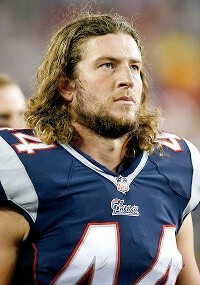 Zach Sudfeld was born April 18, 1989 and is an American football tight end for the New England Patriots of the National Football League (NFL). He played college football at Nevada. On May 3, 2013, Sudfeld signed with the New England Patriots as an undrafted free agent. Among the Patriots' rookie UDFAs, he received the largest signing bonus, $12,000, plus $5,000 in guaranteed salary; his $17,000 in guaranteed money was second among those UDFAs (after wide receiver T. J. Moe's $30,000). Sudfeld's size and catching ability led at least one Patriots reporter to call Sudfeld a baby Gronk, referring to Sudfeld's teammate Rob Gronkowski (although Sudfeld is, in fact, a few weeks older than Gronkowski). During the Patriots' second preseason game, against the Tampa Bay Buccaneers, Sudfeld scored on a two-point conversion from Tom Brady and on a 22-yard touchdown from Ryan Mallett. Sudfeld was named as a potential fantasy football sleeper during the Patriots's 2013 training camp on ESPN's Fantasy Focus Podcast by fantasy analyst Matthew Berry and Jay Soderberg. Football stars such as a Zach Sudfeld have taken the game to new heights by excelling at their respective position. The booking agents at AthletePromotions can assist with Zach Sudfeld speaking engagements or appearances from NFL stars. We have years of experience in booking gridiron greats for keynote speeches and autograph signings. Hiring a football speaker like Zach Sudfeld is not a hard process. Our agents can provide availability, fees and all costs associated in bringing out a successful football star to your next corporate event. We can find Zach Sudfelds agent to make this booking happen. A Zach Sudfeld appearance will add energy to your upcoming event and reward employees, customers and clients.Most likely, football fans and corporations can find Zach Sudfeld's official website, charity involvement, Twitter account, representation, publicist and management info at www.Zach Sudfeld.com.